Last month, a man walked into a credit union near where I live in North Idaho and opened fire. The armed security guard quickly shot him and stopped the threat before anyone else could be harmed. I’m particularly thankful because one of my good friends works in that building. There are some great lessons from the shooting that I want to share with you. Some lessons of textbook things TO do and one that I’d strongly encourage you NOT to do. Let’s start with the specifics…the shooting happened in Coeur d’Alene Idaho at the Global Credit Union on August 11th (Saturday) at about 1PM, right before the credit union was going to close. There was an armed security guard working. He’d been hired because of concerns about a specific manager who recently worked there but was no longer employed by the credit union. The guard saw a man approaching the bank wearing a motorcycle helmet and full facemask. In response, he discretely drew his weapon and hid it behind his leg. The man wearing the motorcycle helmet came in holding a pistol and attempted to shoot the security guard, but had forgotten to rack his slide. In response, the guard shot the man 3 times in the torso. Initial reports are that they “exchanged” gunfire, but I can’t say at this time. The attacker attempted to turn and run but collapsed and died before exiting the building and nobody was injured besides the attacker. 1. It’s amazing how simple most gunfights are. Most follow the rule of threes–3 rounds, within 3 yards, and over in 3 seconds. That doesn’t mean you shouldn’t train for extremes…because you should…but a lot of gun fights are decided quicker than the average shooter can get their gun into the fight. 2. Listen to your gut. It ends up that the attacker WAS the very manager that the security guard was hired to protect the bank from. If the general manager hadn’t listened to his gut and hired the armed guard, this bad day could have been a mass murder. Train your brain on what accurate threat profiles look like and then listen when your spidey senses start going off. 3. The sooner you identify a threat before they start hurting people, the more options you have and the better your performance will be. If the banker would have waited until the shooter opened fire to hop on the phone and call for armed help, the story would have ended very differently. But he was WAY ahead of the curve and made choices that allowed a good guy with a gun to be ready and waiting. The guard had his gun out of the holster and in his hand so that when he made the decision to shoot, his draw stroke was essentially half a second faster. He didn’t have to get to his gun, defeat retention, or clear leather. It was already in his hand…and it’s probably the reason why he didn’t take 2 to the chest while he was trying to engage the shooter. 4. Carrying without a round in the chamber shouldn’t be a long term strategy. Thank God that the shooter forgot to chamber a round before going into the credit union. It could have been a completely different outcome if he would have gotten a first hit on the guard. I look at carrying without a round in the chamber as learning to ride a bike with training wheels. There’s absolutely nothing wrong with it for a time, but I’ve seen countless gunfight videos where people draw and press the trigger without remembering that they needed to rack the slide. There are situations where it makes sense to carry without a chambered round, but if you do, you need to practice drawing and racking until it’s automatic. 5. The first HIT in a gunfight usually wins. The guard shot the shooter 3 times in the torso. Each one of those hits is likely to have thrown off the aim of the shooter…possibly slightly, maybe A LOT. Seeing muzzle blast from a gun aimed at you tends to cause extreme jerking of the trigger. And getting hit may not hurt immediately, but it can still turn what would have been a hit into a miss and it can keep the shooter from firing as quickly. There are dozens of friends and family of the credit union employees who still have their loved ones today because of how quickly the guard was able to make effective hits. Not just spraying and praying, but fast threat stopping hits. They’re critical for military, law enforcement, and responsibly armed citizens. Because the faster you make a first hit and followup hits if necessary, the less likely you or anyone else will be injured by an attacker. The faster you’re able to make hits that stop the threat, the fewer rounds you’ll need to shoot and the fewer chances there are for an errant round to hurt someone. Stories like this one are why I’m so passionate about helping people make fast first hits from the holster. Being able to make fast hits is a skill that, quite literally, saves lives. It stops the threat faster and there are fewer chances for innocent people to get hit in the crossfire. The pursuit of speed forces you to become more efficient. And the cleaner and more efficient your technique, the better it will work in a chaotic real-life and death shooting situation. So, if you own a firearm as a self defense tool, I want to STRONGLY encourage you to sign up for the Draw Stroke Mastery sub-second draw stroke program. 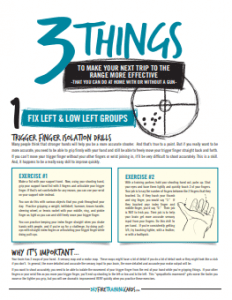 It’s the simplest, easiest, and most advanced approach to firearms training available today. It’s the perfect solution for the shooter who doesn’t have time to train…but knows they need to.